Thursday July 20th 1893 I was busy all forenoon doing baking and getting dinner. Mollie Stevens was here for dinner. I fixed Fathers shirts some in the afternoon and sent them over for Hattie to finish. I went out after my dress that was cut. Mollie went over with Fanny. Friday July 21st 1893 I was busy with the work most of the morning. I went up town for some things. I sewed on my new dress that I had cut. Mother and Mollie Stevens came over and Lib Stevens came here to take Mollie home. I rode up town with Mother. Saturday July 22nd 1893 I was busy all forenoon doing baking my other work. Will was not at work and he helped me wash. Fanny went over the river. I got every thing all cleaned up and I went up town in the evening to come back with Will. 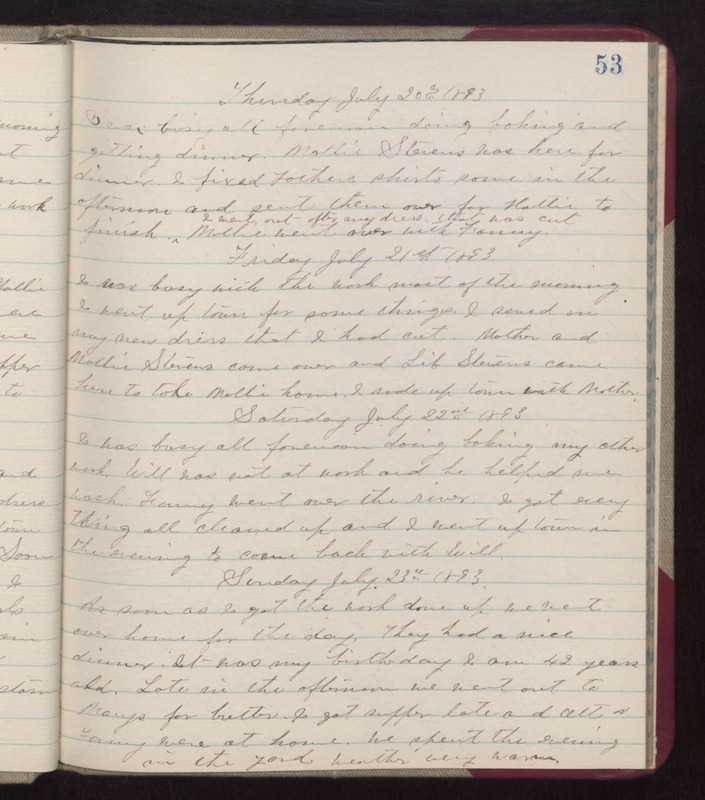 Sunday July 23rd 1893 As soon as I got the work done up we went over home for the day. They had a nice dinner. It was my birthday. I am 42 years old. Late in the afternoon we went out to Marys for butter. I got supper late and Ott & Fanny were at home. We spent the evening in the yard. weather very warm.